Whoever is pulling the linguistic strings at the Banners Broker HYIP cult operating globally online now is channeling Zeek Rewards, AdSurfDaily and AdViewGlobal in their final days. Zeek, an $850 million Ponzi- and pyramid fraud that once suggested participants should change their toilet-paper dispensing habits if instructed to do so, threatened to ban members who didn’t stick to the company’s insidious, Stepfordian chant. It also planted the seed that it would use the courts to gag doubting voices and sue credit unions that dared to speak ill about its “program” that averaged a payout of 1.5 percent a day. And through proxies, Zeek made sure that other MLM companies and executives who’d dare question its outrageous claims knew that the Zeek eye in the sky was watching them. AdSurfDaily, a $119 million Ponzi scheme that promised to pay 1 percent a day, announced that it had filled a pot with $750,000 in cash and would sue critics for tens of millions of dollars. (The U.S. Feds were so moved by the claim that they made sure it was included in an evidence exhibit used to seize more than $80 million in ASD cash.) Prior to the seizure, ASD’s Stepfordian wing made sure that doubters knew their doubts would be reported by right-thinking loyalists to “ASD legal.” After the seizure, some of the ASDers planted the seed that any fellow member who filed a remissions claim through the U.S. Department of Justice would get sued by their fellow members. To cement its thuggery, AVG, a Zeek- and ASD-like 1-percent-a day “program” that gathered millions of dollars, said it was watching what members said about it online and planted the seed it would seek to have the Internet connections of in-house critics shut down. AVG bizarrely (and incongruously) did these things while purporting to have “protectors” in its ranks and while purporting to enjoy U.S. and Florida Constitutional speech and commerce protections from its purported base of operations in Uruguay. Now comes word that Banners Broker, an almost indescribably bizarre “program” whose online steroidal puppeteers have been stringing people along and picking pockets since at least 2012, has accidentally announced that it, too, has become a factory from which MLM thuggery is manufactured. Not only is Banners Broker watching members, the “program” says, its members also are watching members. The news first appeared on the RealScam.com antiscam forum. Given the monitoring policy, individual members who’ve posted negative content should remove it, the “program” instructs. And members who observe other members posting negative content should contact the doubters and provide a copy of the “program’s” policy that bans negativity and threatens management-led account seizures. 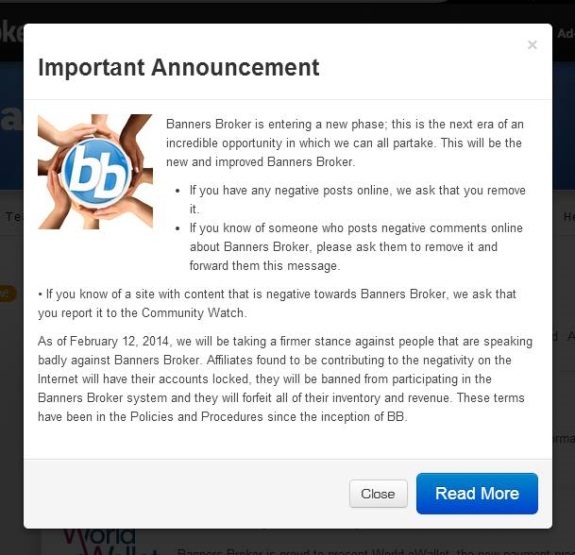 On Feb. 12, Banners Broker will begin to take “a firmer stance against people that are speaking badly against Banners Broker,” the “program” bizarrely bleats. Banners Broker appears also to be trying to chill nonmember critics. “If you know of a site with content that is negative towards Banners Broker, we ask that you report it to the Community Watch,” the “program” instructs. In June 2012, the PP Blog reported that a website selling “customers” to Zeek recruiters also was directing traffic to double-your-money Banners Broker and the 2-percent-a-day (precompounding) JSSTripler/JustBeenPaid HYIP scam purportedly operated by Frederick Mann. For additional background on bids to chill reporters or program members who publish information about scams and highly questionable “opportunities,” see this Dec. 27, 2012, PP Blog post: Our Choice For The Most Important PP Blog Post Of 2012. Come to think of it, Zeek also had a “Zeek Patrol” where allegedly “volunteers” patrol the Interwebs for non-compliant ads, months before it went down the tubes. K. Chang: Come to think of it, Zeek also had a “Zeek Patrol” where allegedly “volunteers” patrol the Interwebs for non-compliant ads, months before it went down the tubes. Thanks for this, K. Chang. As fate would have it, I typed “Zeek Patrol” into Google. One of the top results was a post at the TalkGold Ponzi forum in which serial HYIP pitchman “Ken Russo” (DRdave) was being cautioned against posting his Zeek earnings in the forum. Based on the sig line, the apparent Zeeker who cautioned him also was promoting the ill-fated Bidify knockoff scheme. The post was dated July 3, 2012. The crash-and-burn occurred about a month and a half later. At least Zeek did just crash and burn. They are only going after those they can intimidate into not exposing BB for the Ponzi it is. They don’t have the gonads to go after any forum that will take them to shove it, or try to take them to court. The last place Chris Smith wants to be is in a courtroom, and especially having to go through Discovery. A pathetic attempt to try to control the masses from telling the truth about BB. You can also add this to the list, BB loyalists abusing the internal report function for their own twisted plans. This is a direct quote from one of the BB skype rooms, this individual is called Helen Wright, she provided BB with a video testimonial in October 2013 at a time when millions was overdue in payouts to affiliates. She is also promoting BB and BBmobile to people whilst lying and misleading them. Here she is calling on others to report two people who had put valid concerns and critical comments about BB, which were then copied to other places out of Skype, by other people. Because of this and the fact they are valid comments which show BB in a bad light, she wants people in the Skype room to use the internal report function to censor these two people, when they have done nothing wrong at all. Here is a further post from the Bannersbroker blog at bannersbroker.blogspot.com. The non-payment issue is now at fever pitch and it will be interesting to see how this plays out. On a side note, some of the FastProfitsDaily hucksters later got themselves involved in the launches of Zeek-like ventures. “Paying all affiliates what they are owed would do more to clean up the negative comments on the internet than anything else BBI is trying to do”. Probably the most sensible comment I’ve read about this situation in the last year.